Here at the blog you can view significant articles or content shared on our social media sites! Learn more about EME and see the latest happenings! EME has kicked off 2019 by creating a channel to bring you even more video content including announcements, course topics, and professional tips and tricks. Click below to check it out and subscribe! Featured across all social media pages and our website home page, this quick video goes over what EME is about and what we have to offer for medical professionals. Mock Code Resuscitation Training; Making an uncomfortable situation comfortable! What do you measure when you conduct resuscitation training in your facility? Do you measure compressions, ventilations and other objective, measurable parameters? I bet you do! These are the benchmarks and foundation that we are all looking at when it comes to hands on training. After all, it is measurable. I believe that sometime when we conduct training we often forget that it is incredibly important to identify and understand where the student or course participants confidence and/or comfortability is at the start a course, and again, at the end of the course. At Emergency Medical Education this is one of the top priorities for us when we deliver our CPR Command System Mock Code Training Courses. Specifically in and around cardiac arrest the environment can be extremely chaotic. We believe that we can deliver a course that teaches the foundation to response, instills good resuscitation habits, and increases confidence and comfortability in this dynamic chaotic environment. How comfortable are you participating in cardiac arrest resuscitation? How well do you know your role during a resuscitation? How comfortable are you starting CPR? How comfortable are you in "calling the code" or a "rapid response"? How comfortable are you in doing compressions? How comfortable are you in using the defibrillation monitor on the crash cart? 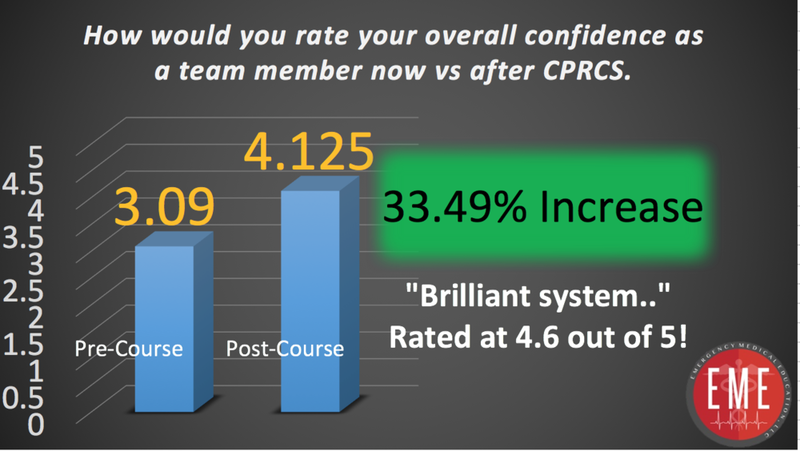 How would you rate your overall confidence as a team member of a resuscitation right now? Each student was asked to rate their confidence on a scale of 1 two 5. 1 being "poor" and 5 being "excellent". Each student was encouraged to be honest with himself/ herself and to choose scores that honestly reflected how they felt about each question. Could you please describe what cardiac arrest resuscitation looks like in your hospital/clinic? Are there any things you would change about the way a cardiac arrest is delivered in your hospital/clinic? We asked these questions and encourage the student to be open and honest with their response. Unlike the prior question, we gave each student that ability to write out their response. This allowed them to be descriptive and pointed with their thoughts. This information was vital to each institutions assessment and evaluation of their current practices in response to cardiac arrest and shed new light on the way their employees felt about the current protocol or approach. So would you like to see some of the data we collected? Below are a series of graphs showing the average score for each question pre-course vs. post-course and the % of increase on that specific question. "Making the uncomfortable situation comfortable!" This was a collection of 32 students survey information, we had an average of 28.19% increase on confidence across all question! Yes, we did measure all of the CPR metrics and taught them how to physically respond to the event of cardiac arrest, but we ALSO made them more confident and comfortable! Thank you for taking the time to look at this data and information! Please let me know if I can visit with you to see if we might be a good fit for you and your team. 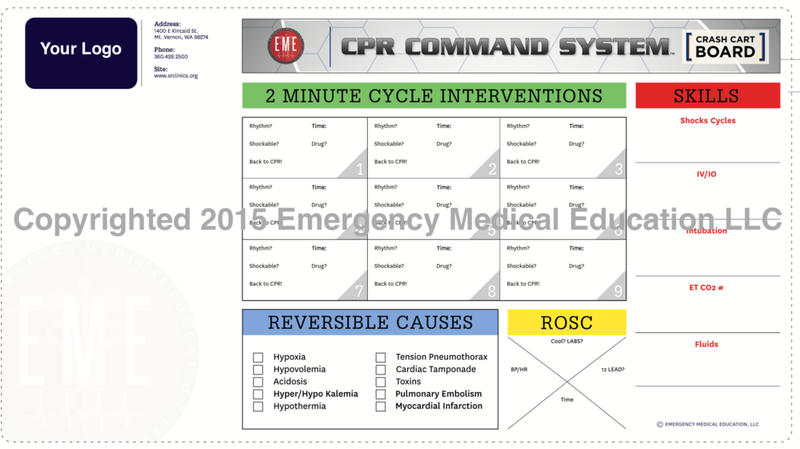 We would love to travel to your location to deliver this one of a kind CPR Command System Mock Code Training Program! Special "Thank You" to Trisha Duerr and Olympic Medical Center in Port Angeles, Washington for having Emergency Medical Education provide this CPR Command System Mock Code Training and sharing this information. His personal story of saving a life while on vacation in Mexico. Emergency Medical Education CEO Mark Sawdon is a practicing Paramedic for King County Medic One in the Seattle, Washington area and has over 20 years of experience in the Fire and EMS service. What motivated him to found EME though? Training course using the CPR Command System (developed by Mark Sawdon). Mark aims to help save lives everyday, but can only do so much on his own. Recognizing untapped potential to further help others, he founded Emergency Medical Education and created the CPR Command System. He saw the opportunity to maximize positive medical results not only for his own patients, but for any healthcare professional interested. Using education and hands-on experience, Mark and his growing team extend their knowledge to others through certifications and assisting in better equipping the emergency medical industry. The EME team routinely teaches American Heart Association re-certification courses and provides resuscitation training to local hospitals and fire departments. Mark also offers his CPR Command System product and training; a predetermined, systematic approach to delivering a cardiac arrest resuscitation. EME has supplied certification and renewals to medical professionals around the Northwest, but has goals to be a go-to resource for healthcare providers across the entire country. In addition to official courses, Mark travels to events across the United States to provide unique insights and methods of his to the forefront of medical education. Everything done by Mark and the EME team is driven by the passion to help others and offer the best chance at saving a life. Emergency Medical Education helps you help others. No matter where you are in the world, when a heart stops, every second counts. EME wants to help ensure that every action counts as well.